The transfiguration. (1-13) An evil spirit cast out. (14-29) The apostles reproved. (30-40) Pain to be preferred to sin. (41-50)1-13 Here is a prediction of the near approach Christ's kingdom. A glimpse of that kingdom was given in the transfiguration of Christ. It is good to be away from the world, and alone with Christ: and how good to be with Christ glorified in heaven with all the saints! But when it is well with us, we are apt not to care for others, and in the fulness of our enjoyments, we forget the many wants of our brethren. God owns Jesus, and accepts him as his beloved Son, and is ready to accept us in him. Therefore we must own and accept him as our beloved Saviour, and must give up ourselves to be ruled by him. Christ does not leave the soul, when joys and comforts leave it. Jesus explained to the disciples the prophecy about Elias. This was very suitable to the ill usage of John Baptist. 14-29 The father of the suffering youth reflected on the want of power in the disciples; but Christ will have him reckon the disappointment to the want of faith. Very much is promised to our believing. If thou canst believe, it is possible that thy hard heart may be softened, thy spiritual diseases may be cured; and, weak as thou art, thou mayest be able to hold out to the end. Those that complain of unbelief, must look up to Christ for grace to help them against it, and his grace will be sufficient for them. Whom Christ cures, he cures effectually. But Satan is unwilling to be driven from those that have been long his slaves, and, when he cannot deceive or destroy the sinner, he will cause him all the terror that he can. The disciples must not think to do their work always with the same ease; some services call for more than ordinary pains. 30-40 The time of Christ's suffering drew nigh. Had he been delivered into the hands of devils, and they had done this, it had not been so strange; but that men should thus shamefully treat the Son of man, who came to redeem and save them, is wonderful. Still observe that when Christ spake of his death, he always spake of his resurrection, which took the reproach of it from himself, and should have taken the grief of it from his disciples. Many remain ignorant because they are ashamed to inquire. Alas! that while the Saviour teaches so plainly the things which belong to his love and grace, men are so blinded that they understand not his sayings. We shall be called to account about our discourses, and to account for our disputes, especially about being greater than others. Those who are most humble and self-denying, most resemble Christ, and shall be most tenderly owned by him. This Jesus taught them by a sign; whoever shall receive one like this child, receives me. Many have been like the disciples, ready to silence men who have success in preaching to sinners repentance in Christ's name, because they follow not with them. Our Lord blamed the apostles, reminding them that he who wrought miracles in his name would not be likely to hurt his cause. If sinners are brought to repent, to believe in the Saviour, and to live sober, righteous, and godly lives, we then see that the Lord works by the preacher. 41-50 It is repeatedly said of the wicked, Their worm dieth not, as well as, The fire is never quenched. Doubtless, remorse of conscience and keen self-reflection are this never-dying worm. Surely it is beyond compare better to undergo all possible pain, hardship, and self-denial here, and to be happy for ever hereafter, than to enjoy all kinds of worldly pleasure for a season, and to be miserable for ever. Like the sacrifices, we must be salted with salt; our corrupt affections must be subdued and mortified by the Holy Spirit. Those that have the salt of grace, must show they have a living principle of grace in their hearts, which works out corrupt dispositions in the soul that would offend God, or our own consciences. Authoritive, and lovely...Jesus' imagery so moving.....Lord forgive us our doubt....let us search your precious Word daily and pray earnestly for all we encounter, as God is faithful! His Raiment that was white as SNOW and Glorious IS the church,We are his vesture dipped in blood as says in Rev. there is no fuller on earth that can whiten like his blood,he was clothed with a Vesture dipped in blood which is the CHURCH,HUMANITY, ON THE MOUNT HE WAS PRESENTING TO GOD A GLORIOUS CHURCH WITHOUT SPOT OR WRINKLE,(US SINNERS) THO YOUR SINS BE AS SCARLET THEY SHALL BE WHITE AS SNOW. Verse 39 :for there is no man which shall do a miracle in my name, that can lightly speak evil of me. that means nobody can heal , or do any miracles if you mock, if you make jokes about the LORD, if you laugh at the jokes. if you are a partaker among people that say offensive things about Jesus ....! This chapter is so encouraging when disbelief and discouragement steps in our lives. It is so easy to lose our focus on the greatness of God almighty and what He could do for us, if only we believe. One of the greatest weapon Satan uses is doubt but once we read Gods word and meditate on it, we would stay in the faith and be able to see him high and lifted up and more than able to help us. What Do You Think of Mark 9? 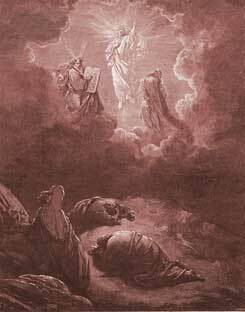 Who appeared alongside Moses at the Transfiguration?